MMAS is a lean organization, with one full-time employee (Executive Director) and three part-time employees (Development Director; Artistic Director & Educational Coordinator; and Office Administrator). Our actors, directors, set builders, backstage and technical people are all volunteers; also the box office and concession staff. We couldn’t function without the ongoing, collaborative help of our volunteers. Last year, volunteers gave more than 32,000 hours to MMAS Black Box Theater. • Office help; sending out regular mailings to our patrons. • Concession area: in addition to working the box office and acting as ushers, volunteers staff the concession area for every Black Box Theater event. • Set building and painting; even if you don’t know how to build or paint, we will teach you! As soon as one play ends, the set is immediately taken down and the building of the next set begins. • Other areas include cleaning the gallery and theater, helping out at the annual arts festival and helping plan the anniversary gala event. If you are interested in helping, please contact us. Any amount of time given is a big help to us. And if you have an idea of where to help that isn’t listed here, we are eager to listen. 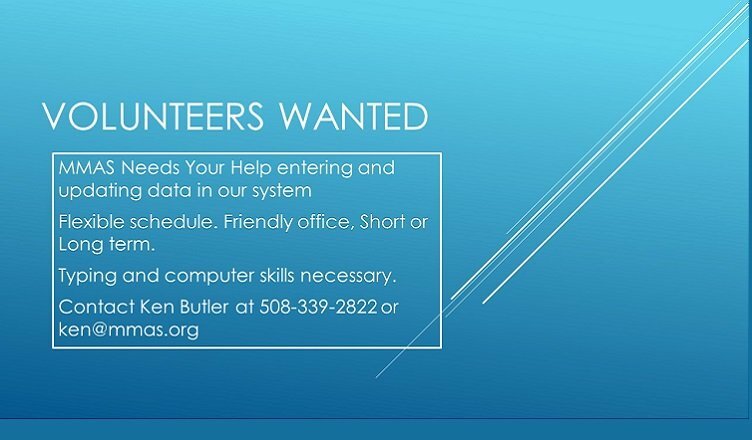 If you are interested in volunteering, email your contact information and interests to office@mmas.org, or call the office at 508-339-2822.